Sharmeena Begum was reportedly the first British schoolgirl to join ISIS. Then-15-year-old Begum left her home in Bethnal Green, London, England, in December 2014 for ISIS-held territory via Turkey.Emine Sinmaz and Sue Reid, “She loved Rihanna, clothes and make-up... then fell under the spell of Islamists: Meet the FIRST British schoolgirl who fled to join ISIS,” Daily Mail (London), March 14, 2015, http://www.dailymail.co.uk/news/article-2994085/She-loved-Rihanna-clothes-make-fell-spell-Islamists-British-schoolgirl-15-fled-join-ISIS.html. Begum had been a student at the Bethnal Green Academy, a private school she attended with her friends Khadiza Sultana, Shamima Begum (no familial relation), and Amira Abase. Two months after Begum’s disappearance, the three girls followed Begum to ISIS-held territory in Syria.Emine Sinmaz and Sue Reid, “She loved Rihanna, clothes and make-up... then fell under the spell of Islamists: Meet the FIRST British schoolgirl who fled to join ISIS,” Daily Mail (London), March 14, 2015, http://www.dailymail.co.uk/news/article-2994085/She-loved-Rihanna-clothes-make-fell-spell-Islamists-British-schoolgirl-15-fled-join-ISIS.html. 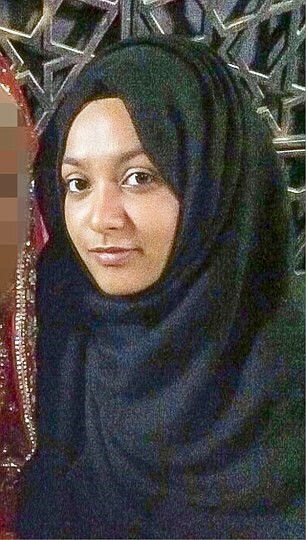 As of February 2019, Sharmeena Begum reportedly remained in ISIS’s last stronghold in Baghuz, Syria.Frances Perraudin, “Shamima Begum tells of fate since joining ISIS during half-term,” Guardian (London), February 14, 2019, https://www.theguardian.com/world/2019/feb/14/shamima-begum-friends-kadiza-sultana-amira-abase-joined-isis-syria. According to Begum’s father, Mohammad Uddin, Begum enjoyed watching soap operas and shopping.Emine Sinmaz and Sue Reid, “She loved Rihanna, clothes and make-up... then fell under the spell of Islamists: Meet the FIRST British schoolgirl who fled to join ISIS,” Daily Mail (London), March 14, 2015, http://www.dailymail.co.uk/news/article-2994085/She-loved-Rihanna-clothes-make-fell-spell-Islamists-British-schoolgirl-15-fled-join-ISIS.html. Begum reportedly grew up in her uncle’s house where she lived with her mother and grandmother. Uddin reportedly traveled often for work. Begum’s uncle Shamim Miah is reportedly a devout Muslim and former religious scholar who encouraged Begum to pray every morning before dawn. Miah denies that his devotion radicalized his niece.Sue Reid, “How jihadi bride’s family sought help from hardline Isis apologists Cage...not police,” Daily Mail (London), April 3, 2015, http://www.dailymail.co.uk/news/article-3025149/How-jihadi-bride-s-family-sought-help-hardline-Isis-apologists-Cage-not-police.html. Begum became more religious after her mother died from cancer in January 2014. She began to wear traditional Islamic garb and argue with her teachers about ISIS.Katrin Bennhold, “Jihad and Girl Power: How ISIS Lured 3 London Girls,” New York Times, August 17, 2015, http://www.nytimes.com/2015/08/18/world/europe/jihad-and-girl-power-how-isis-lured-3-london-teenagers.html?_r=0; Emine Sinmaz and Sue Reid, “She loved Rihanna, clothes and make-up... then fell under the spell of Islamists: Meet the FIRST British schoolgirl who fled to join ISIS,” Daily Mail (London), March 14, 2015, http://www.dailymail.co.uk/news/article-2994085/She-loved-Rihanna-clothes-make-fell-spell-Islamists-British-schoolgirl-15-fled-join-ISIS.html. Uddin believes ISIS recruiters targeted his daughter over her cellphone using the social media applications Twitter and WhatsApp. On December 5, 2014, Begum claimed she was sick and stayed home from school, but instead went shopping to buy new clothes and an iPhone. She then spent the night at her grandmother’s house and disappeared the next day. Uddin alerted authorities after he called his daughter”s cellphone and heard a foreign dial tone.Emine Sinmaz and Sue Reid, “She loved Rihanna, clothes and make-up... then fell under the spell of Islamists: Meet the FIRST British schoolgirl who fled to join ISIS,” Daily Mail (London), March 14, 2015, http://www.dailymail.co.uk/news/article-2994085/She-loved-Rihanna-clothes-make-fell-spell-Islamists-British-schoolgirl-15-fled-join-ISIS.html. Authorities believe she flew from London’s Gatwick Airport to Istanbul, where she crossed into Syria.Katrin Bennhold, “Jihad and Girl Power: How ISIS Lured 3 London Girls,” New York Times, August 17, 2015, http://www.nytimes.com/2015/08/18/world/europe/jihad-and-girl-power-how-isis-lured-3-london-teenagers.html?_r=0; Vikram Dodd, “Sharmeena Begum – British girl left to join Isis after upheavals at home,” Guardian (London), March 13, 2015, http://www.theguardian.com/world/2015/mar/13/sharmeena-begum-first-of-british-girl-isis. In mid-December, Begum called her father to tell him she was in the so-called Islamic State and was “not coming back.”Emine Sinmaz and Sue Reid, “She loved Rihanna, clothes and make-up... then fell under the spell of Islamists: Meet the FIRST British schoolgirl who fled to join ISIS,” Daily Mail (London), March 14, 2015, http://www.dailymail.co.uk/news/article-2994085/She-loved-Rihanna-clothes-make-fell-spell-Islamists-British-schoolgirl-15-fled-join-ISIS.html. Weeks before she disappeared, Begum reportedly deleted her social media accounts, began cutting classes, and learned basic Arabic phrases.Emine Sinmaz and Sue Reid, “She loved Rihanna, clothes and make-up... then fell under the spell of Islamists: Meet the FIRST British schoolgirl who fled to join ISIS,” Daily Mail (London), March 14, 2015, http://www.dailymail.co.uk/news/article-2994085/She-loved-Rihanna-clothes-make-fell-spell-Islamists-British-schoolgirl-15-fled-join-ISIS.html. Uddin monitored his daughter’s phone records in the days after she disappeared. He noted Begum made several calls while in Turkey, and believes authorities could have done more to stop his daughter during the few days she spent in Turkey before crossing into Syria.Emine Sinmaz and Sue Reid, “She loved Rihanna, clothes and make-up... then fell under the spell of Islamists: Meet the FIRST British schoolgirl who fled to join ISIS,” Daily Mail (London), March 14, 2015, http://www.dailymail.co.uk/news/article-2994085/She-loved-Rihanna-clothes-make-fell-spell-Islamists-British-schoolgirl-15-fled-join-ISIS.html. Two months after Begum disappeared, Sultana, Abase, and Shamima Begum crossed into Syria from Turkey. Police had questioned the girls after Begum’s disappearance, but they all denied knowledge of her whereabouts.Katrin Bennhold, “Jihad and Girl Power: How ISIS Lured 3 London Girls,” New York Times, August 17, 2015, http://www.nytimes.com/2015/08/18/world/europe/jihad-and-girl-power-how-isis-lured-3-london-teenagers.html?_r=0. However, the three girls reportedly told Begum’s father that she had been taking cellphone calls from an unknown woman. British police reportedly told Uddin that two women had encouraged his daughter to join ISIS and accompanied Begum to the airport.Vikram Dodd, “Sharmeena Begum – British girl left to join Isis after upheavals at home,” Guardian (London), March 13, 2015, http://www.theguardian.com/world/2015/mar/13/sharmeena-begum-first-of-british-girl-isis. Uddin allegedly warned the Bethnal Green Academy to watch the three girls after his daughter’s disappearance,Emine Sinmaz and Sue Reid, “She loved Rihanna, clothes and make-up... then fell under the spell of Islamists: Meet the FIRST British schoolgirl who fled to join ISIS,” Daily Mail (London), March 14, 2015, http://www.dailymail.co.uk/news/article-2994085/She-loved-Rihanna-clothes-make-fell-spell-Islamists-British-schoolgirl-15-fled-join-ISIS.html. but the girls successfully crossed into Syria in February 2015.Katrin Bennhold, “Jihad and Girl Power: How ISIS Lured 3 London Girls,” New York Times, August 17, 2015, http://www.nytimes.com/2015/08/18/world/europe/jihad-and-girl-power-how-isis-lured-3-london-teenagers.html?_r=0. Following Begum’s disappearance, her uncle, Miah, reportedly called the British Islamic advocacy group CAGE.Sue Reid, “How jihadi bride’s family sought help from hardline Isis apologists Cage...not police,” Daily Mail (London), April 3, 2015, http://www.dailymail.co.uk/news/article-3025149/How-jihadi-bride-s-family-sought-help-hardline-Isis-apologists-Cage-not-police.html. The organization, which claims its mission is to “empower communities impacted by the War on Terrorism,”“About Us,” CAGE, accessed September 17, 2015, http://www.cageuk.org/about. reportedly told Miah that Begum went to Syria “to get married” or “for radicalization” by ISIS.Sue Reid, “How jihadi bride’s family sought help from hardline Isis apologists Cage...not police,” Daily Mail (London), April 3, 2015, http://www.dailymail.co.uk/news/article-3025149/How-jihadi-bride-s-family-sought-help-hardline-Isis-apologists-Cage-not-police.html. Begum was allegedly in Baghuz, Syria, as of February 2019, according to an account by Shamima Begum.Frances Perraudin, “Shamima Begum tells of fate since joining ISIS during half-term,” Guardian (London), February 14, 2019, https://www.theguardian.com/world/2019/feb/14/shamima-begum-friends-kadiza-sultana-amira-abase-joined-isis-syria. Sharmeena Begum was reportedly the first British schoolgirl to join ISIS. “I’m in Islamic State and I’m not coming back.”Emine Sinmaz and Sue Reid, “She loved Rihanna, clothes and make-up... then fell under the spell of Islamists: Meet the FIRST British schoolgirl who fled to join ISIS,” Daily Mail (London), March 14, 2015, http://www.dailymail.co.uk/news/article-2994085/She-loved-Rihanna-clothes-make-fell-spell-Islamists-British-schoolgirl-15-fled-join-ISIS.html.